This week is Mental Health Awareness Week, with its theme of 'Stress: Are We Coping? ', and in recent weeks, members of the HeadStart team have been working in schools with young people supporting them in developing coping strategies for dealing with stress. This topic is particularly relevant at this time of year, with Year 6 SATs having taken place this week, and the exam season for GCSEs and A Levels in full flow. calming crafts: creating homemade glitter jars, homemade stress balls and stress relieving homemade slime! Feedback given to staff from the young people who attended was extremely positive and confirmed the positive outcome from the sessions. All young people fully appreciated the range of activities on offer through the sessions, including the more calming element to the sessions of learning mindfulness relaxation and breathing exercises. A number of young people expressed how they found it really helped them, and how they even found themselves so relaxed they were almost asleep by the end! Staff informed me that students arrived for their SATS examinations following our sessions with their homemade stress balls and practising their breathing activities before entering the examination. A number of students approached me during the workshops to thank me for listening to them and coming in to do what they had asked for from HeadStart during our initial planning session. 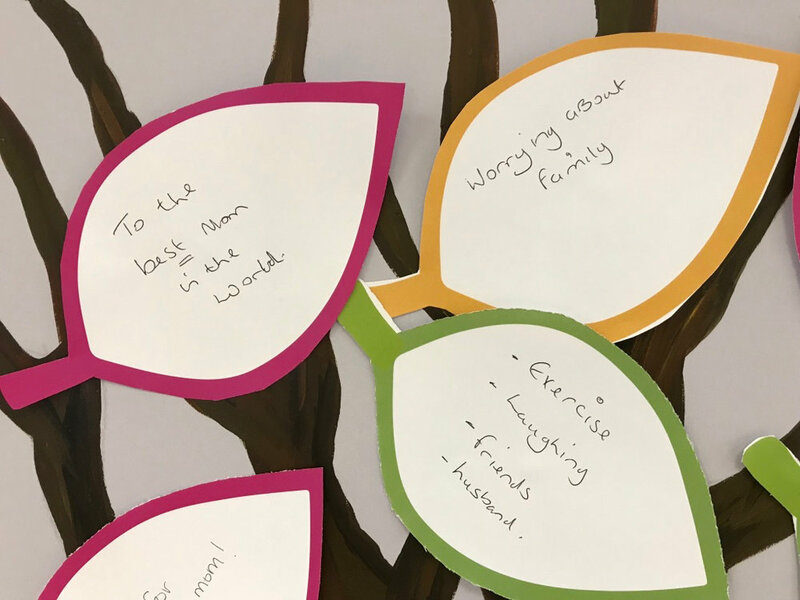 When asked how useful the workshops had been the response was extremely positive with all members feeling they had enjoyed the sessions and had taken something away that they felt could help them when they were worried, stressed or anxious in the future, and especially during this SATS. All year 6 pupils felt this was something that should be on offer for all year 6 pupils across the city as it really helped them stay calm and focus during the examination week. What do young people say about stress? Q. What makes you feel anxious or stressed? Q. What does stress feel like – physically and emotionally? Q. Do you have ways to deal/cope with your stress? What are they? Q. What helpful ways have you seen or are you aware of that people do to cope with stress? Q. What unhelpful things have you seen or are you aware of that people do to cope with stress? Q. If you could give one piece of advice or coping with stress, what would it be? Don’t take it out on other people, take time out, walk your dog by yourself, have someone to talk to. 'Stress' podcasts from Moreton School! Huge thanks to Tara and Sam for sharing their insights from two of our wonderful HeadStart schools! Last night's workshop at our HeadStart base for All Saints, Blakenhall, Parkfields and Ettingshall, The Bob Jones Community Hub, brought together over 20 young people and parents for training in the basics of mindfulness. The session was led by trainer Adam Dacey from MindSpace UK. People attending the session were introduced to mindfulness techniques including mindful camera, mindful standing and mindful walking. An air of calm descended upon the session for an hour as everyone focussed on techniques to 'live in the present'. More photos to come from the session soon! The programme includes a wide range of activities, including family cooking, well-being warriors, gaming sessions, craft cafe and much more! For more information about the activities, and how to book places, please download this flyer. 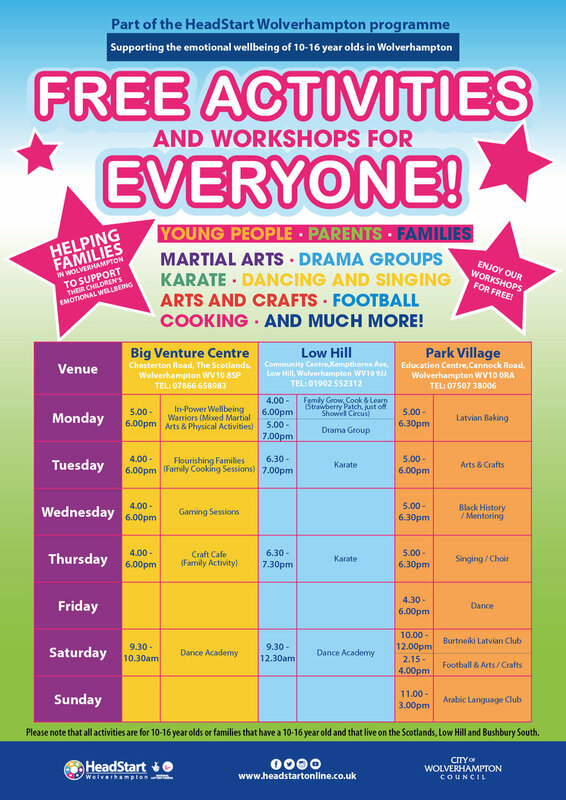 Activities in the area are lead by Black Country YMCA, and follow a weekly timetable, repeating until the start of June, with sessions run from Eastfield Community Centre, Park Village Education Centre, and Holy Trinity Church Hall. Monday 14th May, 4:30pm to 7:30pm, A Place to be Me at Bilston Town Hall. Activities for young people 10 – 16yrs based around coping mechanism to deal with stress. Wednesday 16th May, 4:30pm to 7:30pm, A Place to be Me at Bilston Town Hall. Activities for young people 10 – 16yrs based around coping mechanism to deal with stress. The Newshounds from Gazebo are also out and about in the city collecting media on events in Bilston and elsewhere! Mindfulness is a set of techniques that anyone can use to calm the mind, focus on your priorities, and reduce stress and anxiety. On Wednesday 16th May from 4:15pm to 5:15pm, Adam Dacey, the founder of Mindspace, is leading a free mindfulness workshop. Activities in the area are lead by Black Country YMCA, and follow a weekly timetable, repeating until the start of June, with sessions run from Bob Jones Community Hub and All Saints Community Centre. For details of each of the activities, and for detailed timetables, please download the complete programme. Press release: Come and see HeadStart in our popup shop on Saturday 12th May. Shoppers are invited to call into HeadStart Wolverhampton's pop-up shop in the Mander Centre this Saturday (12 May) to enjoy free activities for all the family. 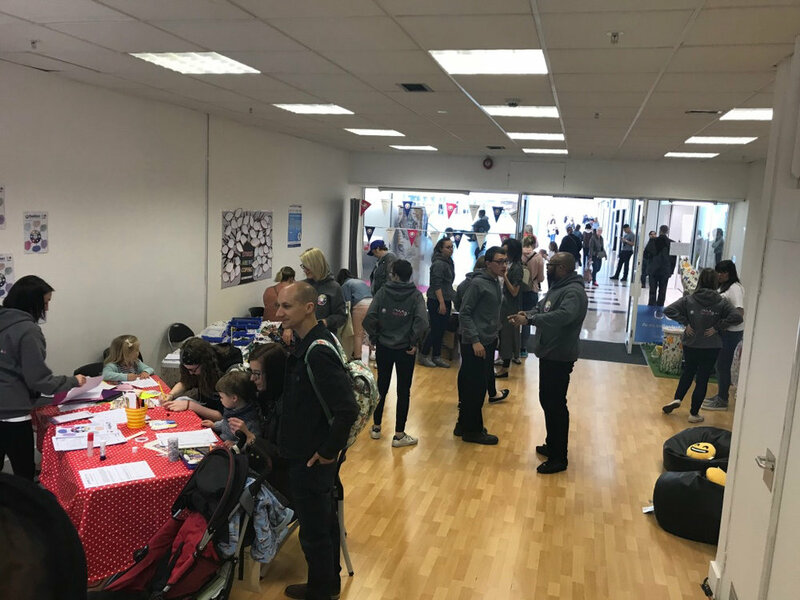 The pop-up shop, on the first floor between New Look and The Works, launches HeadStart Wolverhampton's week of activities to mark Mental Health Awareness Week 2018. The theme of this year's week is "Stress: Are we coping? ", and the HeadStart team have designed a programme of events all centred around stress relief. The pop-up shop, open from 9am to 5.30pm, will offer a range of free activities for young people aged 10 to 16 years, including Lego workshops and arts and crafts designed to relieve stress. There's also a chance to meet the HeadStart Wolverhampton team and find out more about the support available for young people and their families, while visitors can collect free goodie bags with art activity packs and additional resources to support young people in coping with stress. Hope, the HeadStart Wolverhampton wolf, will also be making a guest appearance. Designed by the HeadStart team, she was originally on display as part of the popular Wolves in Wolves project which took place last summer. The pop-up shop is a fantastic way to start HeadStart Wolverhampton’s Mental Health Awareness Week events. Mental Health Awareness Week runs from 14-20 May and is organised by the Mental Health Foundation. For more information, please visit Mental Health Foundation. To find out more about what HeadStart Wolverhampton has planned during the week, please visit Mental Health Awareness Week 2018. HeadStart Wolverhampton, part of a £56m National Lottery funded programme set-up by Big Lottery Fund, is designed to improve the emotional mental health and wellbeing of children and young people aged 10 to 16 by giving them the skills they need to cope with the challenges they face. 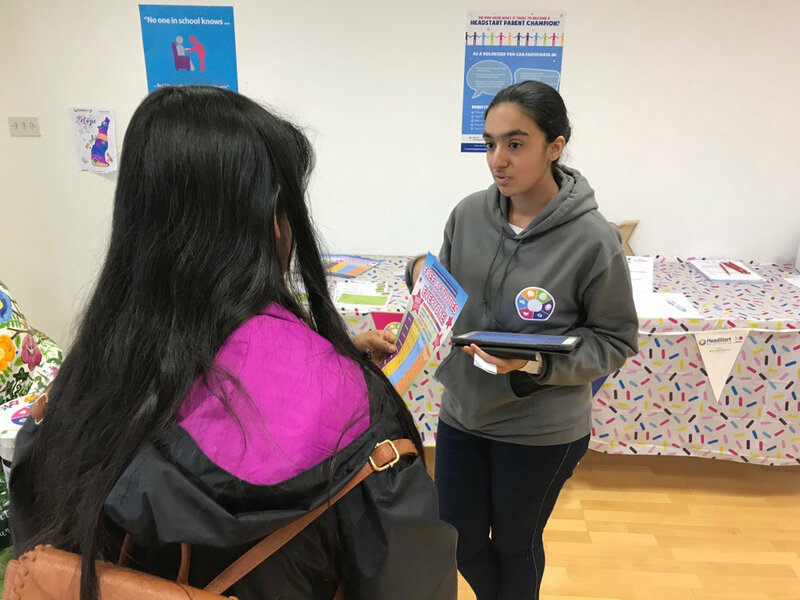 As well as running a series of specific programmes in its four key target areas, HeadStart Wolverhampton offers city wide help through a Support and Guidance Directory which provides emotional mental health and wellbeing resources from different organisations, including information targeted at young people, parents and carers, and professionals. You can find the directory at www.headstartonline.co.uk/support. To find out more about HeadStart, please visit HeadStart, follow @headstartfm on Twitter or Instagram, or find HeadStart on Facebook.